Choosing the best tactical flashlight AR15 is a daunting task especially if you want to find the most practical item that ensures high performance. It’s high time you make the update on your arsenal collection to basically boost your target precision, ensure comfort, and diversify the use of your AR 15 rifle. So what exactly should you look for in a rifle tactical flashlight? 5 Which of these models is the best tactical flashlight for AR15? Tactical flashlights are not your ordinary device that you use to provide temporary lighting that is portable and handy at the same time. No wonder there is also a significant difference in the price range of this flashlight type that could affect your buying decision. Poly Tac LED AR15 Flashlight by Streamlight. The device is the most affordable in our lineup but it is definitely not the least when it comes to quality and performance. It generally received good ratings from actual users and the innovative technology used for its design is impressive such as the parabolic reflector for maximum lighting. LED Tactical Flashlight by Orion. The unit is a mid-range option and while it is at the middle of our price scale, this tactical flashlight is nothing moderate when it comes to its high powered 500 lumen LED light. It ensures secure mounting capacity for tactical and combat use and the materials used for its construction are anything buy cheap. T20CS LED Flashlight by Sunwayman. The most expensive in our list, this tactical flashlight brand offers a great deal for your money with its high 658 Lumen LED light brightness. Other top notch features of this high-end model include a powerful beam distance of up to 278m through its high quality and durable metal smooth reflector. It may require you to shell out extra cash but the flashlight is worth every dollar. The tactical flashlight’s tough material contributes to the performance and durability of the unit which is vital especially in extreme outdoor conditions, terrains, and unstable light sources. Different tactical flashlight brands have their own unique construction as well which result to the overall flexibility and function of the AR15 rifle. 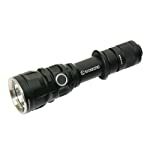 T20CS LED Flashlight by Sunwayman. The military-grade flashlight is made with hard anodized body that makes its construction versatile, tough, and definitely long-lasting. It is also waterproof and the tempered glass lens is multi-coated in order to withstand impact and scratches. The model is fully equipped with the rear switch and the AP01 remote switch where you can remotely detach the light off the rifle and convert it into a hand-held device. Poly Tac LED AR15 Flashlight by Streamlight. This is one of the toughest tactical flashlights in the industry which also garnered numerous approvals from users due to its long-lasting quality and performance. The Streamlight unit is made with formidable materials such as the exceptionally strong and high-impact nylon polymer to withstand scratches, force, and harsh weather conditions outdoors. It is also made with the superior grip design for a comfortable slip-resistant finish. It comes with a limited lifetime warranty. LED Tactical Flashlight by Orion. Compact and fully equipped with water resistant and recoil proof design, the Orion military-grade flashlight is an average option. It is worth the mid-range price and the unit also comes with a worry-free 1-Year Warranty to cover all material defects and broken parts with free replacement. The cutting-edge technology used for this device also includes the remote pressure switch so that you can control the device without too much restriction. Without superior and high output, the tactical flashlight is not at all qualified to be given a military-grade score. The flashlight output determines how far and wide the illumination scope of the flashlight is in order to ensure better and more accessible vision on your terrain. Thus, one of the most important things to consider when looking for the best tactical flashlight for AR15 is through gauging its Lumen capacity or output. LED Tactical Flashlight by Orion. This unit is one of the high-grade flashlight models not just in our list but in the military-grade arsenal collections as well. The unit boasts of the 500 lumens LED light with Cree XM-L U2 technology. The design of this flashlight that makes it highly efficient is the secured rifle-mount and pressure switch. The bulb is also protected with the shockproof construction to ensure continuous lighting function regardless of the outdoor conditions. Poly Tac LED AR15 Flashlight by Streamlight. The Streamlight flashlight has the lowest output in our list with only 120 Lumens but with a brighter C4 LED high flux technology, offering more powerful illumination than ordinary high flux variations. The flashlight also comes with a 4,800 candela peak intensity beam. T20CS LED Flashlight by Sunwayman. The brightest and the highest output in our list is the tactical flashlight from Sunwayman, offering up to 658 Lumens in turbo setting. Other output settings are 476 lumens in medium and 18 lumens in low light. The beam distance of this unit could also reach up to 278m. The high-performing accessory for your AR15 comers with a tactical-on side switch for better and easier operation. Which of these models is the best tactical flashlight for AR15? What is the range or distance that the flashlight must cover? What is your allocated budget for your tactical flashlight purchase? How tough and often are you going to use the lighting device? Updating your arsenal with the best accessories such as the best tactical flashlights for AR15 is a lucrative venture that offers numerous benefits, primarily boosting your performance especially in low light or dark environments. Military-grade flashlights have integrated designs that allow you to securely and easily mount the device on your rifle for better vision and target acquisition. Learn more about today’s must-have rifle accessories such as shooting mat, scope for ruger 10/22, and bushnell trs 25. Hi, I’m Kate from VASTFIRE. Our company is a professional flashlight manufacturer. Our company wants to promote our brand and AR 15 Flashlight. How To Choose The Best 30mm Scope Rings For The Money 2019?